From many reports on his behaviour one can recognise the hysterical as well as the paranoid trend of his personality. (Some authors however point out that Feuerbach by the end of his life apparently stopped believing in Hauser; at least he wrote a note to be found in his legacy which read: "Caspar Hauser is a smart scheming codger a rogue a good-for-nothing that ought to be killed. Stanhope continued to pay for Hauser's living expenses but never made good on his promise that he would take him to England. 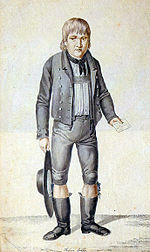 Kaspar Hauser (30 April 1812 (?) – 17 December 1833) was a German youth who claimed to have grown up in the total isolation of a darkened cell. Hauser's claims and his subsequent death by stabbing sparked much debate and controversy. These have long since been rejected by professional historians.